This artist's illustration represents the variety of planets being detected by NASA's Kepler spacecraft. Scientists now say that one in six stars hosts an Earth-size planet. 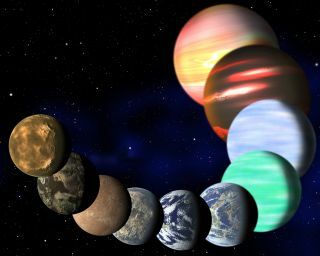 Four of the five main databases that catalog the discoveries of exoplanets now list more than 900 confirmed alien worlds, and two of them peg the tally at 986 as of today (Sept. 26). So the 1,000th exoplanet may be announced in a matter of days or weeks, depending on which list you prefer.